Here are some weight loss tips to help you beat the bloat and enjoy your holidays without packing on the extra pounds. Break the cycle now - for you - and future generations in your family! Skinny Fiber is a dietary supplement with ingredients that help control your appetite. If you take it correctly each day and are mindful of portion sizes, it can really help control overeating during the holidays and throughout the 2015 New Year. The product also helps with fat absorption, detoxing and energy. It will only be to your benefit to take Skinny Fiber daily just as you do your other supplements. Since it only takes 4 to 7 days for delivery in the United States, as well as in other regions with distribution centers, you can have your Skinny Fiber in just a few days by ordering now ... in time for the holidays. Plus, the special BOGO packages make Skinny Fiber affordable enough to give the gift of health to friends and family this year. Keep everyone on track with you! Healthy Food & Drinks - Do Not Skip Meals! Many people let themselves build up a roaring appetite before Thanksgiving and Christmas dinners, as well as when attending holiday events. They also do this to their kids (not wanting to spoil their appetite for dinner). Can you relate? I certainly can! I remember my step mother feeding us breakfast and then going to work on the holiday meal. Meanwhile, I'd go crazy for the rest of the day until horderves were served right before a 5:00 pm or 6:00 pm dinner. I was starving by then, and ended up with the same habit as an adult. This really does contribute to the obesity problems. Plus, fosters this bad habit for future generations during the holiday season. This can be a dangerous for anyone trying to lose or maintain weight loss! Instead, it is best to stay with the routine of eating breakfast and lunch daily. Eating healthy snacks between meals are helpful, too. Staying on track with regular HEALTHY EATING (being mindful of portions and calories) helps ensure that you don't overeat when it comes to the richer, unhealthy foods, during celebrations. The ideal meals should be high in protein and fiber from vegetables; eating more dense foods earlier in the day and lighter eating in the evenings works well for weight loss. If you are the one hosting Thanksgiving or Christmas meals, please cook according to your weight loss diet (Atkins, Paleo, Weight Watchers, Etc) by planning exactly what you are cooking for the meal(s). There is no reason to stop eating what has been working for your weight loss. Don't shop randomly; find the recipes and make sure you know which are the healthier alternatives for certain ingredients. DO NOT SNACK WHILE COOKING!!! A taste here and nibble there can end up being as many calories as a meal. If you are a guest for holiday dinners, eat your healthy snack before leaving your home. If your holiday dinner is hosted by a family member, don't hesitate to call ahead to learn what's on the menu and plan to bring a healthy side dish, diet friendly dessert and / or drinks with you. Believe it or not, beverages are an important detail to plan for your holiday meals. Thanksgiving / Christmas dinner means lots of soft drinks, egg nog and cocktails . While water is the ideal beverage for maintaining weight loss, don't be afraid to substitute tea with stevia instead of water if you absolutely can't do without the flavor. If the alcohol starts flowing later in the evening, opt for a glass of wine or a light beer if you are watching your fat and calories. If doing Atkins, you must drink low carb alcohol options as not to ruin your progress. This will allow you to enjoy a celebratory drink without undermining your goals. All of these healthy eating tips will increase satiety and make you less likely to get stuffed on stuffing at holiday dinners. The goal is to keep yourself filled up on healthy foods, so that you are not as hungry and much less likely to BINGE eat over the holidays. Treat yourself if a certain type of food fits your diet plan, though commit to just a taste instead of your previous year's indulgent portion sizes. Drinking plenty of water throughout the day will also help! The weather, traveling, special events, get togethers and extra errands can interfere with your exercise schedule, so you need to commit RIGHT NOW to maintaining your fitness routine over the holidays, too! Mall shopping is not the same activity as mall walking, so don't try to fool yourself into thinking that your getting the same quality of activity! It's just not the same as an interval routine on your treadmill or speed walking the mall when it's empty in the morning. The general rule is not to go more than 2 days without exercising. NO EXCUSES! Wake up earlier than everyone else, so that you can hit the hotel pool or gym - OR - make it a family activity if your children are old enough to keep up! Pack an exercise DVD that you can exercise while staying with family - OR - opt to board with a family member that has an exercise machine or home gym! Additionally, schedule physical activities to do with the family. Winter sports are incredible calorie crunchers including ice skating, roller skating, skiing, snowboarding, sledding, sightseeing by foot, etc. The goal is make holiday fitness fun for your whole family and to keep yourself on track for exercise during Thanksgiving and Christmas months. All of the previous weight loss tips apply when traveling for the holidays, though you'll need to plan on even more details and get creative in some cases, too. For example, if you're doing Atkins or another low carb diet, eating on the road can be more expensive and feel torturesomely limited. It is so much easier to find gluten free and weight watchers meals on restaurant menus then to guarantee that there is no sugar in the sauces and spices in your meals. This is especially true for diabetic dieters, as well as those worried about high blood pressure or cholesterol. You have to ask the waitress to check every time or prescreen the restaurants' nutritional guides. This can help no matter which diet plan you follow. Go to the restaurants website first! Most of the popular ones either have alternate choices directly on their menus (such as the Olive Garden's gluten free section) or provide nutritional information on each menu item (look for this on the page with the food description or look for a complete list with all food items). Sleeping During The Holidays Whether Staying Home or Traveling! 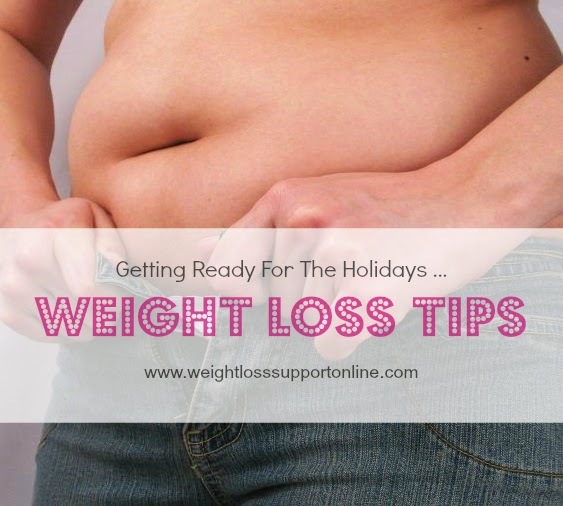 Tips For How To Lose Weight During The Holidays! Thanksgiving and Christmas are the most difficult times of the year for anyone who is trying to slim down or keep off the weight . Yet, this doesn't mean that you have to give in to the holiday weight gain cycle. By using the weight loss tips above, it is entirely possible to eat delicious and filling meals without turning the holiday into a stressful event. You can maintain your fitness routine and sleep schedule, too. Commit to staying on track by joining our weight loss program today! Eat normal foods while letting the weight loss supplement work in your body and do your part with the rest of the healthy lifestyle changes! Personal support is available to you free, too! P.S. Don't forget to add me as a friend on Facebook and use the SHARE buttons below to give this article to family and friends - help them lose weight and become healthier, too!